Without discussion or debate, the City Council tonight gave preliminary approval to a $21 million appropriation to cover the Baltimore Police Department’s latest shortfall in its perennially over-budget overtime costs. If there was debate, it had taken place earlier. 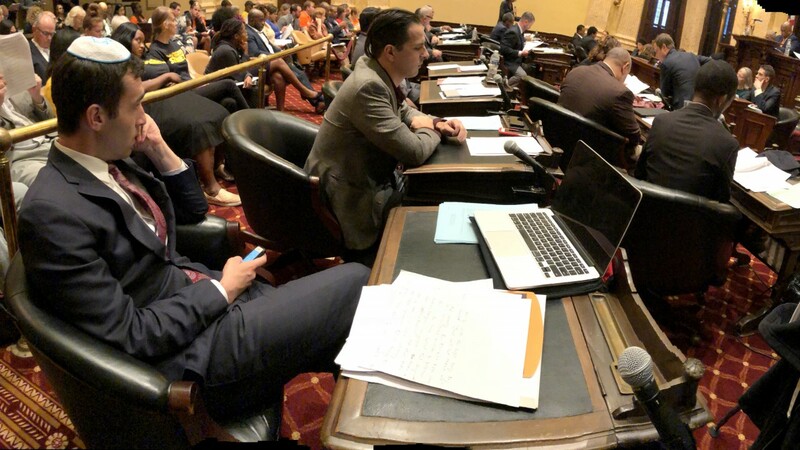 Supporters of the spending bill have argued that the measure (unanimously defeated in committee in July) could be okayed now because the Council and Mayor Catherine Pugh had begun oversight and reform. Critics, like Councilman Brandon M. Scott, have expressed little confidence in the administration and said the runaway OT problem was far from solved. 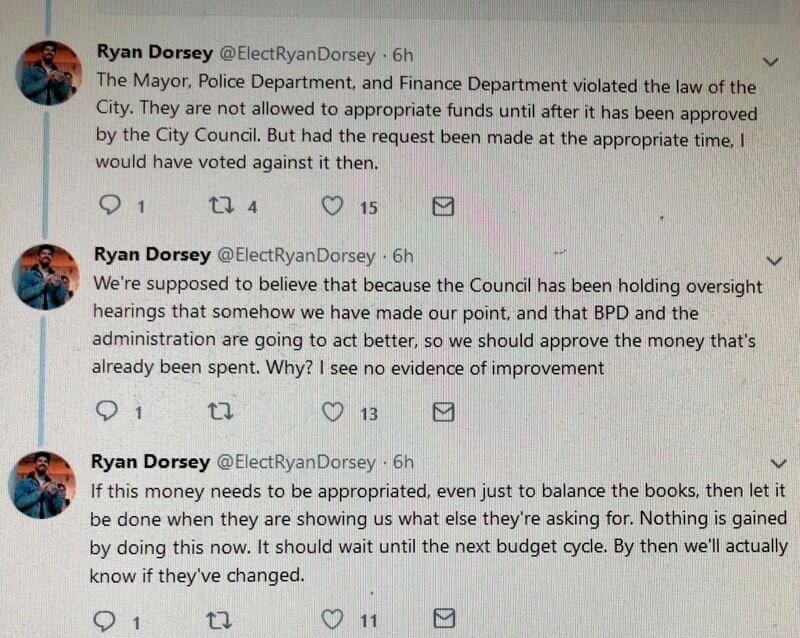 Voting “no” on Council Bill 18-0265 tonight were Scott, along with Kristerfer Burnett, Zeke Cohen, Ryan Dorsey and Shannon Sneed. Voting “yes” were John T. Bullock, Mary Pat Clarke, Eric T. Costello, Bill Henry, Sharon Green Middleton, Leon F. Pinkett III, Edward Reisinger, Isaac “Yitzy” Schleifer and Robert Stokes. A final third reader vote on the bill will take place at the Council’s next meeting on November 19. “It is presented as something we should shrug about, since the money is already spent. I’m not about to shrug about twenty-one million dollars,” Dorsey tweeted. Here’s the rest of the thread. In other action, the Council passed Dorsey’s “Complete Streets” bill, which requires the Department of Transportation to ensure that roads are useable not just by automobiles but by buses, cyclists, pedestrians and all users. Also receiving final approval was a bill that increases property sale taxes with a goal of generating a $20 million fund for affordable housing. Both bills had supporters in the chamber, who cheered and clapped as the measures were approved on third reader. Another measure approved by the Council would require newly built businesses with public restrooms to make diaper-changing facilities available for both women and men. Several speakers during the meeting denounced Saturday’s fatal shooting at a Pittsburgh synagogue. “The death of these 11 Jewish Americans in a synagogue on the Sabbath is the logical conclusion of a rhetoric that permeates our political discourse and festers online,” Cohen said. “It is deployed against Muslims, refugees, immigrants, women, LGBTQ Americans, people of color and Jews. It is wielded by craven profiteers in online forums and on the radio, on TV and in the halls of power in Washington DC.